Aside from the ridiculously expensive rental phones available at international airports, cellular voice service in Japan is legally restricted to residents. Therefore, issues regarding identification verification are tangentially related to the topics commonly discussed here, though admittedly, today's topic - verified mail at the Japan Post - is a bit of a stretch. We'll try to lead it back to mobile in the end. In July of this year the Alien Registration Card （外国人登録証明）issued by municipal governments was replaced by the "zairyu card"（在留カード）issued directly by the Ministry of Justice. However, the old ARCs may remain valid until their expiration dates, so there will be a couple of years during which both will be floating around. Private industries may choose to accept one, perhaps the other - or maybe neither - as valid forms of identification. 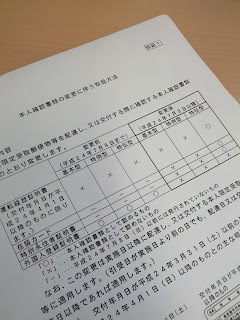 However, this is contrary to the information contained in the relevant Post office web page, which specifically states that no type of foreign registration card is acceptable at all - neither the old ARC nor the new or zairyu card, and even the Special Permanent Resident cards that provide special privileges and exceptions to ethnic Koreans who are born in Japan but choose not to become citizens. Please be aware that from 7/9/2012, foreign registration cards (including the zairyu cards and special permanent resident identification) are no longer acceptable documents for the purpose of identity verification. OK. So which is it? It turns out both are half right and half wrong at the same time. The zairyu card may be used for identity verification, but only for the most restrictive of the three types, 特伝型 (tokudengata, which is short for 特定事項伝達型). This is the most extensive form of verification in which the sender is also allowed to access to the verification details including the type of ID used (with number), the name and birthdate displayed on the ID, the name of the postal employee who performed the verification, and the date verification was performed. Tokudengata is only available at select post offices, and if the ID shown displays a maiden name or an old address, unlike with the other two methods, the package will not be released. The other two types are 基本型 (kihongata) and 特例型 (tokureigata), which are much less restrictive. The zairyu and SPR cards may not be used for kihongata and tokureigata!. With both tokudengata and tokureigata, delivery is possible. You'll have to visit the post office to pick up kihongata mail. Clarification is provided on another page deeper into the J Post website. At the top of this post is the a document from the post office outlining the changes, which is in English below. Note that the driver license history card is not an actual license. There appears to be no logical reason why the zairyu card is good enough for the most restrictive verification methods, but unacceptable for the lesser two methods. It seems that the post office has been making changes to the acceptable forms of ID over the past several years. In addition to the ARC, other forms are no longer usable. (I didn't ask for examples). Though keep in mind there may always be issues with a foreign passport because since it cannot verify your address, only your identity. One common way of proving residency is by showing your foreign resident card, but in the case of mobile contracts, this is not always the best option. For example Softbank Mobile, for reasons that baffle, allows (allowed?) fewer initial payment options to customers using an ARC as identification. Plus, there are legitimate concerns regarding the handling of the personal information on the card. Therefore alternate forms of identification are preferable, such as a health insurance card together with a utility bill, which allows for payment through bank transfer. This option is also available to those who present a driver's license. Seriously. If you are going to be here for an extended period of time, even if you don't plan to drive at all, get one. Either way you look at it, a driver's license is by far the best form of identification to show. 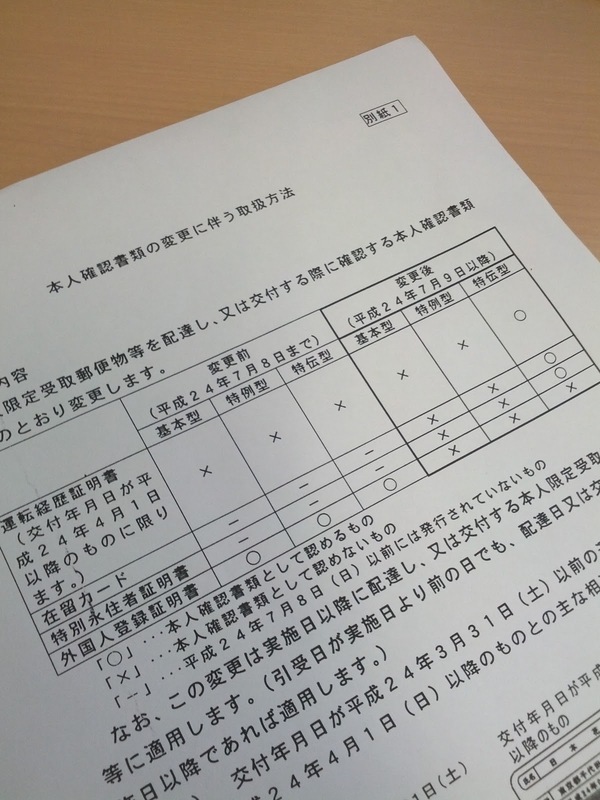 It is a photo ID issued by the government that displays much less personal information than a gaijin card.We wrote about the process of obtaining one here. It is by far less complicated and time consuming than many are led to believe.